Build a galactic empire in the depths of space as you battle with other players for control of the universe. Cosmic Encounter is an intense, time consuming and satisfying game for those that enjoy highly strategic and space themed games. Intended for the serious tabletop gamers out there, Cosmic Encounter is great for players ages 14 and older and will take you one to two hours to complete a game. The rule book can be a bit daunting at first but after a quick glance through and a good example game to play or watch, you'll get the hang of it pretty fast. 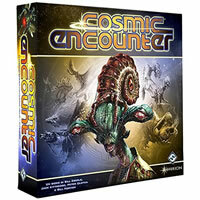 Check out Cosmic Encounter and add it to your game collection today. The winner(s) are the first player(s) to have five colonies on any planets outside his or her home system. You will get 42 cosmic tokens 1 warp, 5 player colony markers, 1 hyperspace gate, 25 player planets, 100 plastic ships, 50 alien sheets, 20 destiny cards, 72 cosmic cards, 50 flare cards, 20 tech cards, 7 grudge tokens, 1 genesis planet, 1 lunar cannon token, 1 prometheus token, 1 alternate filch flare and the official Cosmic Encounter game rules and instructions. Please keep in mind that the official Cosmic Encounter board game rules and instructions could be different depending on the game version you have. The rules below are some of the exact directions on how to play Cosmic Encounter. Share with us your comments, funny stories, tips, advice, strategies, creative ways to play, questions about how to play, problems with the rules or anything you want about Cosmic Encounter. All submissions will be reviewed within 24 hours. Click here to add your Cosmic Encounter comments.